2. Create a new page for your first team member. The title of the post will be the name of the team member, the featured image will be the headshot, and the content of the page will be the bio on the single page view. 3. Set the parent of this page to the "team" page, which was just created. 4. Repeat steps 2 and 3 for as many team members as you want! Note: the "team" page in the Showcase Pro demo also has a Custom Body Class called "full", which makes the content be 100% across. To add that class, scroll down to the Layout options and add "full" to the Custom Body Class input. NOTE: you must add the ID of the parent page of the team members page in order for only those pages to show up. You must also add a featured image for the grid to work as well. If no featured image is added then the page will not show up in the grid. Why is this way to set up the team members? The primary reason is to give you the opportunity to have a flexible setup. Some people wanted books instead of team members, or a portfolio. Now, you can simply rename the parent page and it will update the URL. So you can use this method to create a portfolio, or grid of books, or really any content you want. And you can have complete control over the URL structure. To add a team member, go to your dashboard and navigate to Team > Add New. The title of the post will be the team member name, the featured image will be the headshot, and the body of the post will be the body of the team member bio. The ideal size for the team member headshot is 1920 x 1280px. This way it will show up nicely in the page header area on single team member pages. To have your team members display on a page, such as your About page, simply select the Team template from the template options for that page. 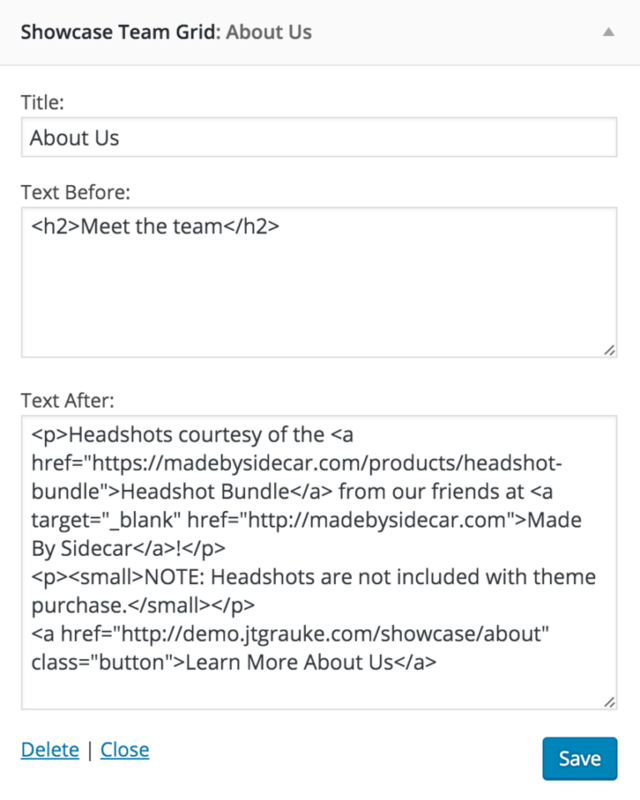 Team members will then automatically display at the bottom of that page and you can add content above it. For more information on setting up the front page widget areas, please see this page.